In an interview published to the Web on Monday, Norman Foster, founder and chairman of architectural design firm Foster+Partners, explains the thinking behind Apple's Campus 2, including late cofounder Steve Jobs' input on the project. 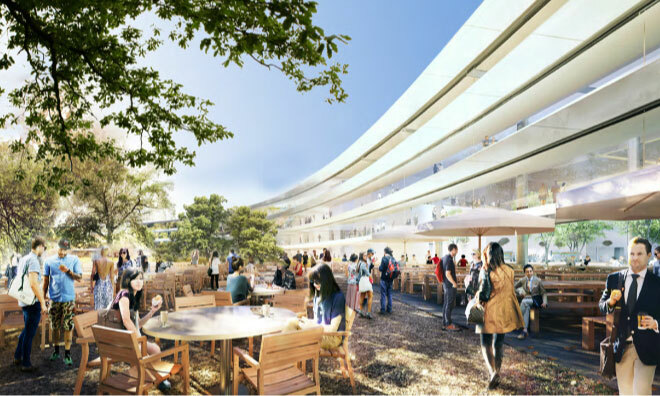 Rendering of courtyard in center of Apple's Campus 2 main building. Speaking with the Architectural Record, Foster offered a rundown of his most revered works, from the iconic Swiss Re tower in London (also known as "the Gherkin"), to large-scale projects like Terminal 3 in the Beijing International Airport. To the designer, scale is key to the human experience. "Then, as I say, there is the constant reference to the outside--the fact that you don't feel you're being led down blind alleys," Foster said of Beijing International. "You always have this sense of knowing where you are--you always have a sense of space." As applied to Apple's Campus 2, which is now under construction after months of permit seeking, Foster is bringing 12,000 employees into one main building. Traditional designs would call for 16 or 17 buildings, much like the layout of the former Hewlett-Packard site before Apple took over. Not only will the new design pack in more people in a central structure, but the area covered by buildings is to be much less than HP's campus. Foster's office says construction will cover only 13 percent of the site. As for the ring, the architect calls the structure compact, alluding to his work with airport designs. The main reference point for Jobs, who took part in Campus 2 planning, was the Main Quad at Stanford University. "One idea which came out of it is that you can get high density by building around the perimeter of a site, as in the squares of London," he said. "And in the case of a London square, you create a mini-park in the center. So a series of organic segments in the early studies started to form enclosures, all of which were in turn related to the scale of the Stanford campus." In addition, Jobs wanted an aesthetic that harkened back to the California of his youth, when the state was the "fruit bowl" of the U.S.
"These studies finally morphed into a circular building that would enclose the private space in the middle--essentially a park that would replicate the original California landscape, and parts of it would also recapture the orchards of the past," Foster said. "The car would visually be banished, and tarmac would be replaced by greenery, and car parks by jogging and bicycle trails." Foster goes on to explain the intricacies of scale and how they apply to Apple's project and beyond.